T Junction Function and Wedding band play a mix of classic Pop & Rock. A multi-award-winning group based in Glasgow T Junction is a professional live four-piece band offering high-end wedding and corporate party entertainment. 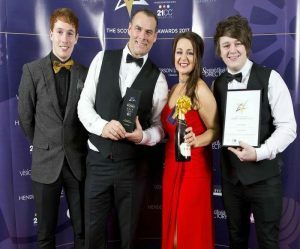 The band is renowned for delivering high-end Corporate Music & Entertainment to a Multi-National customer base across Scotland and the UK for the past 15 years and have performed for a list of satisfied clients including ROSPA, Tesco, Celtic FC, Strathclyde Police, Glasgow City Council, Admiral, Rangers FC, BP & VW to name just a few. They have entertained at thousands of events and wedding for over 17 years. Here are just a few comments from happy customers. We had a super day! The band was brilliant! A fantastic night! The dance floor was full from start to finish. My guests described the band's performance as "fabulous and dynamic- what a night! T Junction has a versatile set list and is the perfect mix of classic & modern Rock, Pop, Soul & Disco plus a short Ceilidh option if required. For a full Ceilidh experience with Live fiddler (five-piece option), the band offers up to one hour throughout the evening. They also provide a dance caller to step the audience through — the dances. They have three times won the Scottish VOWS Award for best Wedding Band in Scotland for outstanding performance and customer service. They have been runners up in the same category three times T-Junction are: Maggie is a highly-talented professional lead vocalist who is a character with immense versatility in her vocal range. Her passion for entertaining and her perfectionist approach are quite evident in her performances. Colin has been a full-time musician for several years and holds a degree in Film and Television Music, also Music and Audio Production. As the band's Musical Director, Colin's rock style guitar performances give the group a cutting edge. Paul graduated from the University of Edinburgh with a degree in Music and is the band's keyboard/piano player. John Ross on drums. As well as perfect timing, he has outstanding ability in vocals and guitar. They also bring in another Girl singer when required. T Junction aims for excellence and makes it a top priority to ensure that your evening is a roaring success. The band is available for hire in Glasgow, Edinburgh, Aberdeen, Dundee and throughout Scotland.